This Easy Creamy Summer Macaroni Salad Recipe is perfect for summer BBQs and potlucks. With just a handful of ingredients this easy macaroni salad recipe is ready in 15 minutes. 2.) It’s very, very delicious and very adaptable as well. So basically, you can pretty much adjust this easy creamy summer macaroni salad recipe according to your taste. Don’t like olives? Skip them and add relish instead. Don’t like cucumbers (who are you even?) add carrots or celery! Add grilled chicken/tuna to make this salad a complete lunch or dinner. Add chopped boiled eggs to make this into a hearty macaroni salad. You can even add different condiments like mustard, buffalo sauce, or even sriracha sauce! Different types of soft cheese would work well in this macaroni salad would work great too. I sometimes add feta cheese to this salad and it turns out fabulous. 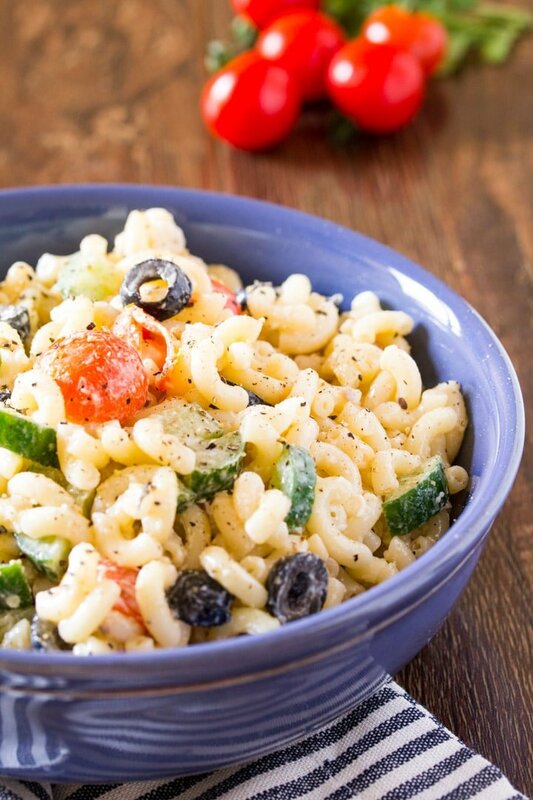 The more veggies you add to this macaroni salad, the yummier it turns out. I’ve added chopped bell peppers, corn and peas in this salad and they make this salad even yummier. This salad would go great with this Easy Chicken Korma Curry and white rice. This creamy macaroni salad also pairs really well with burgers and hotdogs. It would be great with some BBQ chicken too. Yum! Pin this Easy Creamy Summer Macaroni Salad Recipe here! In a medium sized mixing bowl, combine the elbow macaroni, mayonnaise and white vinegar and mix until combined. Add the cherry tomatoes, cucumbers, black olives, dried oregano, and salt & pepper and mix well. What an easy recipe to make for the next family picnic! There’s something so appealing about the many colors of veggies in this salad! Such a simple recipe but packs a punch of flavor. So comforting too. You’ve put together the quintessential summer salad, it’s perfect for potlucks, backyard bbqs and everything in between. Can’t wait to try it! This is such a good recipe! My kids are going to love it! Pasta is a much desired ingredient in our meals and always looking for new recipes to incorporate. would love to try the recipe using vegan mayonnaise. Will be pinning it for later. 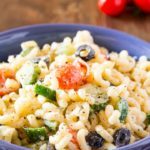 I love a good macaroni salad to bring to my church’s potluck, I love all the ingredients in yours plus it looks so easy to prepare. How light and fresh this looks. This will be perfect for the upcoming summer picnics and memorial day weekend going to print it off and save it. My whole family will love it especially the g rand children they love pasta and this is right up their alley! This looks delicious! And welcome back to blogging! I know the pain of morning sickness and having to take some time off! Wow, this salad looks very tasty! I like all the ingredients in this recipe! It’s a great idea for lunch! Thank you for sharing this great recipe! Love the cucumbers in my macaroni salad. I’ll have to try adding olives next time I make it! It looks delicious. Perfect for a quick lunch at work. 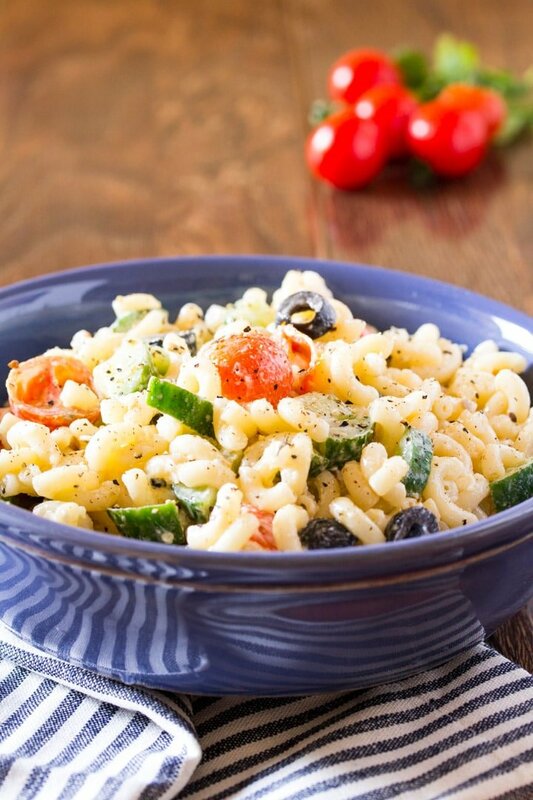 This creamy macroni salad looks delicious great to give it to kids this way we can get them eat some veggies also. It is colorful salad great for barbecue parties too. Congratulations on the new addition to the family! This macaroni salad is bringing me all the summer time feels! Looks so delicious! 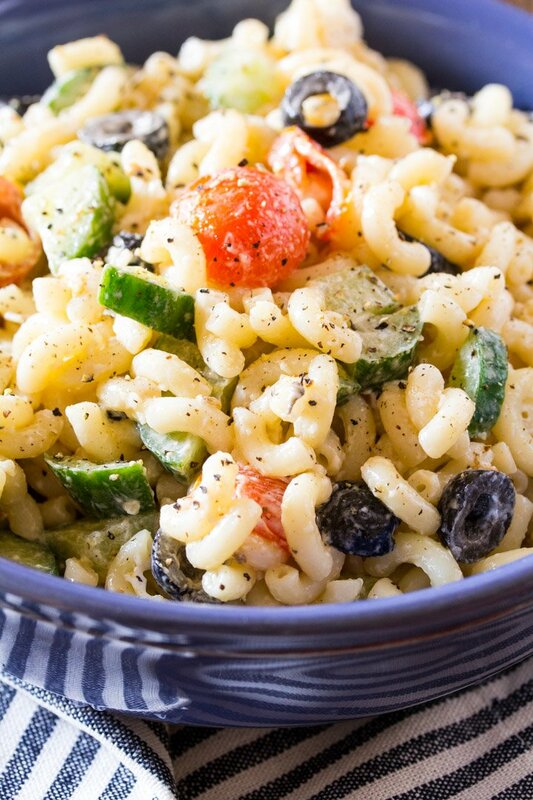 Adding cucumbers to this macaroni salad is perfect to give my picky kid to eat some veggies. This is also great for a quick brunch with friends.